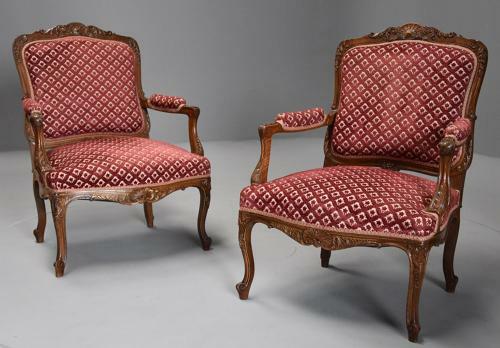 This pair of chairs consist of a cartouche-shaped padded and upholstered back with carved central scallop shell decoration to the top of the frame wth scrolling acanthus below and to either side with further carved scrolling acanthus and floral decoration to the outer edge and also to the base of the back supports. This leads down to the upholstered arms with acanthus carving supported by s-scroll arm supports with carved shell and acanthus decoration. The upholstered sprung seats having a serpentine shaped seat rail, the rail having carved scallop shell to the centre with carved acanthus below and to either side. The chairs are supported by four cabriole legs, the front legs having carved acanthus decoration and all terminating with a scroll foot. The chairs are upholstered in a red fabric and although the upholstery is in good order the chairs could easily be re-upholstered in a fabric of choice once purchased. This pair of chairs are in very good condition for age, are of stable construction and can go straight into a home.